When a mom discovered what her teen’s seventh-grade teacher had given her child at school, she sent the educator something back that the teacher was probably not expecting. The California mom posted about the circumstance on Facebook, opening up a massive debate about who was really in the wrong — the mom or the educator. 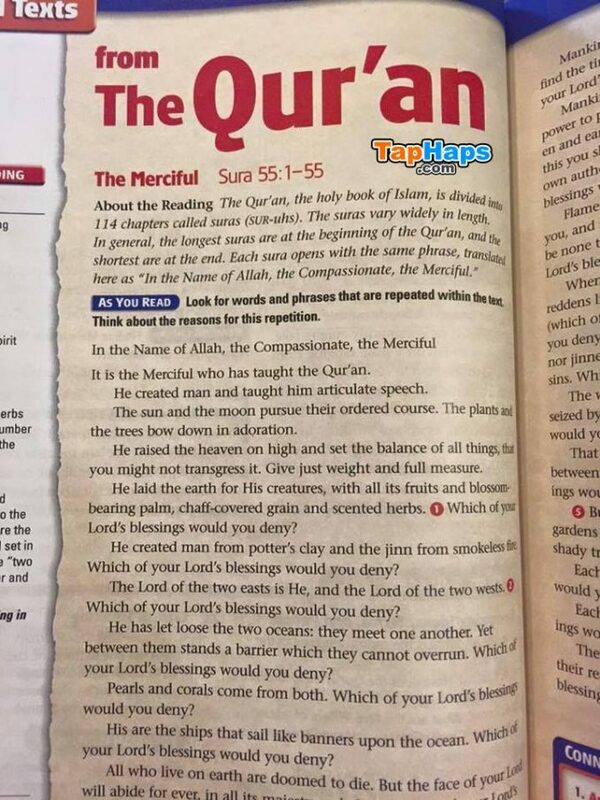 Tara Cali posted a photograph of her response to her son’s homework assignment about Islam, but she probably wasn’t expecting it to create so much discussion. The Bakersfield mother wrote a reply on her son’s homework sheet on the subject of “Islamic Beliefs and Practices,” and she posted a picture of her disapproval to the Facebook page of local news station KGET. The World History class assignment required seventh graders to list the five pillars of Islam, which include charitable giving, prayer, fasting, faith, and holy pilgrimage. 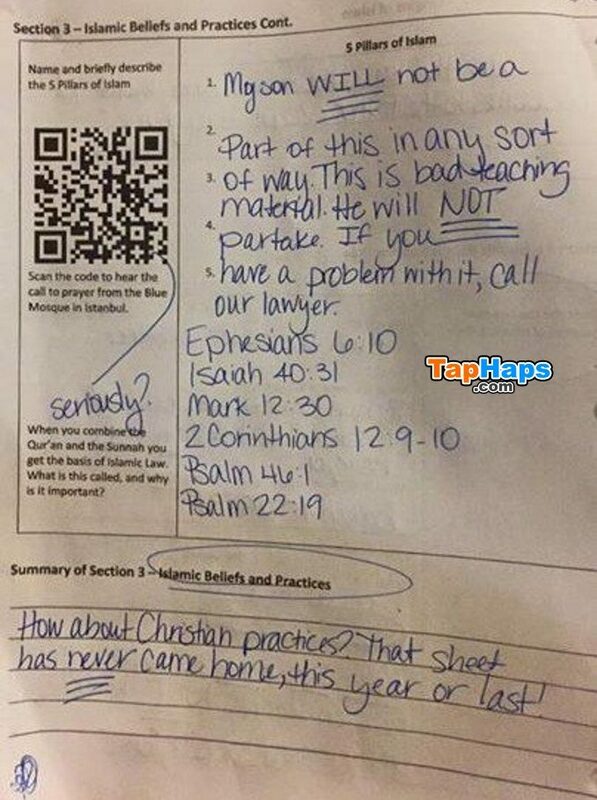 The homework assignment included a bar code that allowed students to listen to a YouTube video of the call to prayer at the Blue Mosque in Istanbul, Turkey. California’s state-wide curriculum allows religions to be taught only in the context of history. Tara Cali feels the Islamic lesson plan doesn’t stay within those parameters. Her issue isn’t with Islam but rather how it’s being taught. In her opinion, the school is showing favoritism to Islam over Christianity and other religions. Instead of listing the 5 Pillars of Islam, Tara got a little creative with her answer. “My son WILL not be a part of this in any sort of way. This is bad teaching material. He will NOT partake. If you have a problem with it, call our lawyer,” Tara wrote. After listing several Bible verses to support her stance on the matter, Tara asked a question at the bottom of the page. “How about Christian practices? That sheet has never come home, this year or last!” she stated. The textbook used across California covers the fall of Ancient Rome through the Age of Enlightenment. 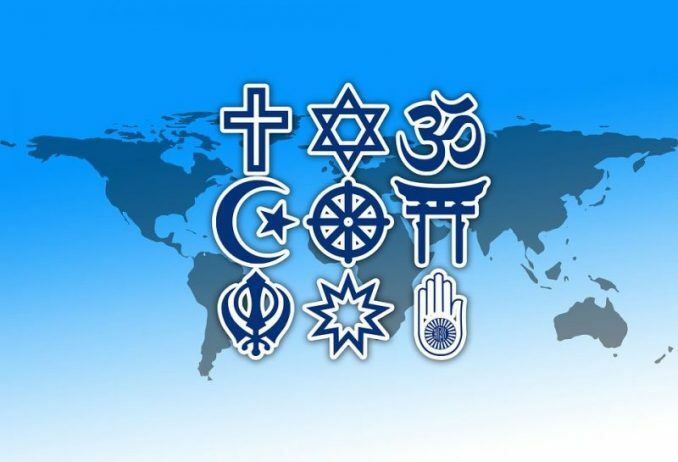 The textbook also includes chapters on the historical prominence of various world religions, including Christianity. So, why has Tara never seen an assignment on Christian beliefs and practices? We can only speculate.